Taking one of the many Toronto Harbour Cruises is an incredibly exciting and enjoyable way to see picturesque Toronto Islands, flourishing waterfront and soaring Toronto skyline. The harbour tours give you completely different perspective of Toronto - very calm and composed as opposed to typical hustle and bustle. Toronto Harbour sightseeing cruises are relaxing 1-hour tours which offer breathtaking views of Toronto skyline, close up look at the scenic Toronto Islands and its tranquil lagoons. Most of the sightseeing tours offer live commentary and narration. For those who want to spend little extra time (and of course money!) having more fun, Toronto dining cruises offer great experience aboard. Indeed, bright and sunny weather is ideal for Toronto boat tours, but rainy days have its own laid-back charm. Most of the cruises depart from Toronto Harbourfront Centre and many cruise operators have their ticket office at the Harbourfront Centre. 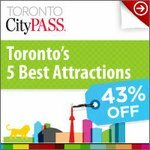 Browse various Toronto Harbour cruises below and select the one that best fits your time and budget. Welcome aboard! This inner harbour cruise offers a relaxing sightseeing experience and is a unique way to admire Toronto's sights from the water of Lake Ontario. As you move along Toronto's inner harbour, sit back and enjoy unparalleled views and vistas of Toronto's towering skyscrapers and landmarks including the iconic CN Tower, Rogers Centre, Toronto City Airport, HTO Park, and Harbourfront Centre. Then, the cruise will take you through the many lagoons that divide various Toronto Islands. The best part of this cruise is that it allows you to get off on the Centre Island to enjoy a wide variety of fun activities  rent a bicycle or boat, swim at one of the beaches, relax in the lush green gardens, stroll through gardens, enjoy rides at the Centreville Amusement Park, or savour delicious food at one of the restaurants. You can then re-board your cruise at your convenience. The one-hour Toronto Harbour cruise offers live commentary and narration. Are you looking to spend the evening out with someone very special? How about taking a one-hour evening sightseeing cruise on Toronto's Inner Harbour and then romantic dinner at an elegant restaurant? Great idea! 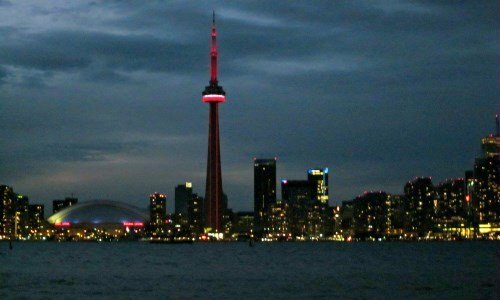 The inner harbour evening cruise lets you enjoy magnificent views of towering Toronto skyline, beautiful Toronto Islands parks and lagoons under the stars and moon. While you cruise the inner harbour, you might see the sun sliding below the horizon (on clear evening!). As the cruise drift by picturesque parklands and serene lagoons, Toronto lights up for the twilight presenting you with outstanding opportunities to take some Instagram perfect photos. On board you will enjoy interesting and informative narration from knowledgeable and witty guide. Overall, this evening cruise offer great sailing experience. Toronto harbour sightseeing tour is a scenic one-hour guided voyage of beautiful Toronto harbour and Islands. Aboard the spacious and comfortable ship, enjoy and admire stunning sights and scenes of vibrant Toronto. The guide offers fun, friendly and informative commentary while pointing out passing landmarks and icons including the CN Tower, Rogers Centre, Harbourfront Centre, HTO Park, Toronto Islands Airport, Sugar Beach, and Gibraltar Point Lighthouse. Once inside the canals and lagoons of Toronto Islands, feast your eyes on flora and fauna and experience the splendour and stillness of the urban oasis. Take your seat on the lower deck and enjoy a cocktail at the bar or relax on the upper deck or soak up the sunshine on the outdoor deck - either way, keep your camera ready! Unlike Toronto Inner Harbour and Island Cruise, this cruise does not stop on any of the islands, so you cannot disembark and catch a ride back afterwards.